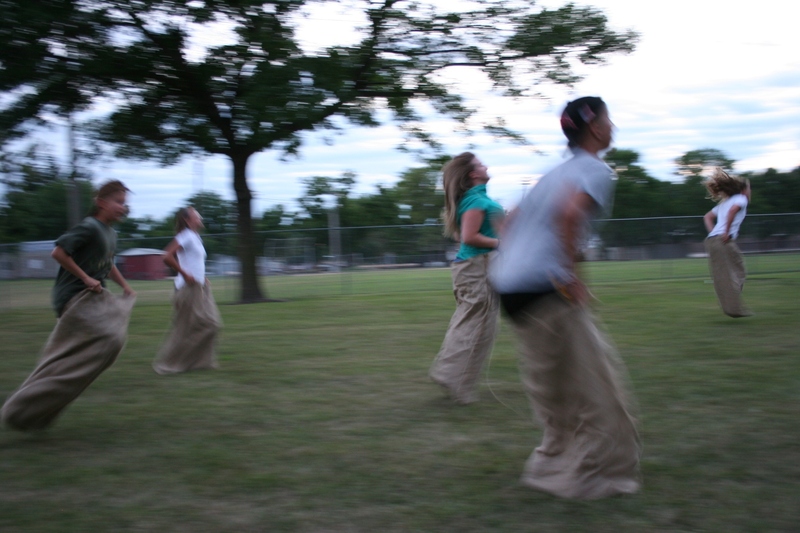 Old-fashioned games like a gunny sack race, a three-legged race, and running with eggs on a spoon have been popular activities at recent Kletscher family reunions. MY COUSIN LYNN doesn’t realize it, I’m sure. But when she repeated to me several times at this past weekend’s Kletscher family reunion that we need to keep this going, that not all families are like ours, gathering every year, remaining connected, sharing memories of the past, I knew that she was absolutely right. 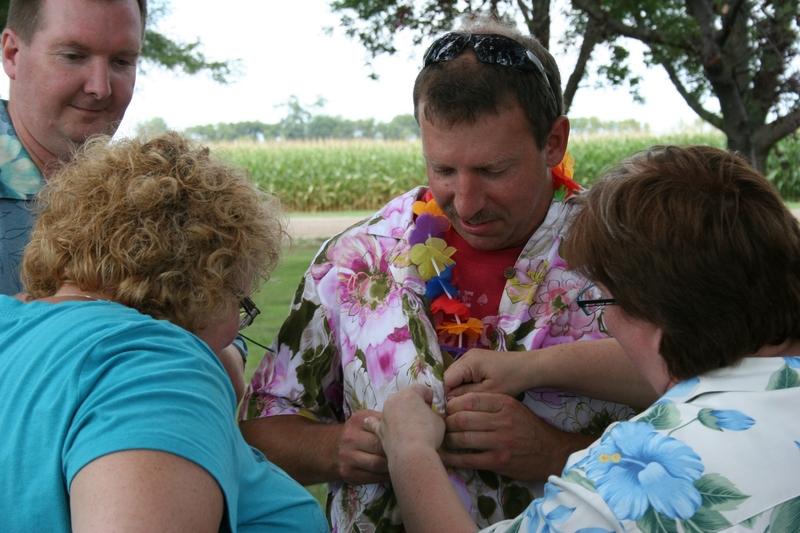 The reunion originated many, many years ago as an annual summer picnic for descendants of Rudolph and Mathilda Kletscher, my great grandparents. As their son Henry’s family grew, a reunion for the family of Henry and Ida, my grandparents, was established. In my 55 years of life, I bet I’ve missed only a handful of Kletscher reunions. It’s that important to me to attend this yearly gathering in my hometown of Vesta. These aunts and uncles and cousins (and my grandparents, long ago deceased) were very much a part of my life when I was growing up as we all lived in close proximity to one another. Saturday evening, circled around a campfire in the Vesta City Park, we shared memories of the many, many times our family celebrated birthdays and anniversaries. While the uncles clustered around card tables to swig beer and play cards so many decades ago and the aunts visited, we cousins raced in the dark shadows of farm yards in raucous games of “Starlight, Moonlight.” And then, when the wooden crate of pop bottles was pulled out, we swarmed to grab the rare treat of bubbly beverages. Such were our memories (some best kept within the family) shared as darkness settled upon the prairie. Campfire flames flared and sparked while conversation ebbed and flowed as only it can in the comfortable familiarity of family. 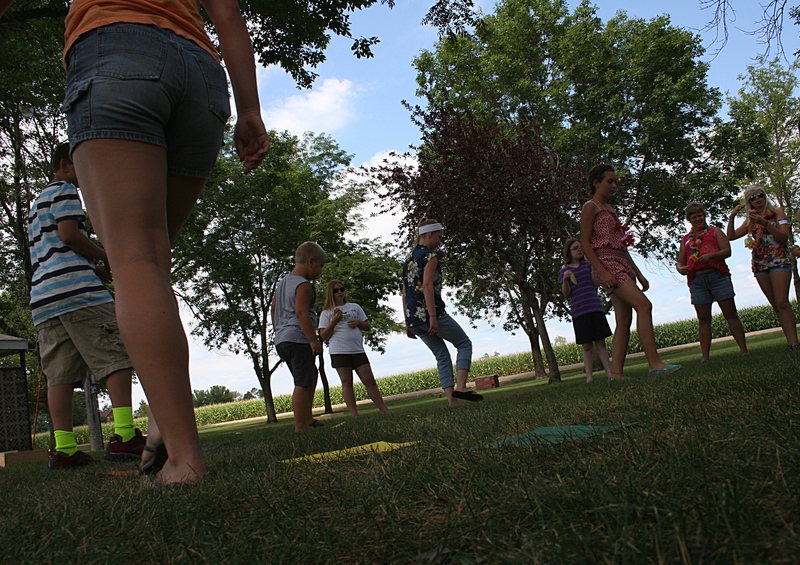 The cupcake walk, a popular activity two years ago, was brought back. 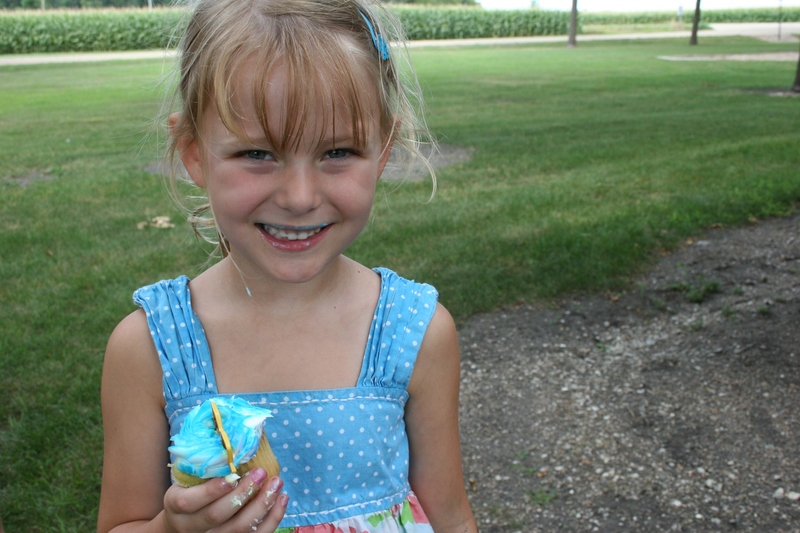 Elle, one happy little girl with a cupcake. She’s also an excellent hula hooper. I need only see the excitement in the faces of my cousins’ kids and grandkids’ and the smiles on my cousins’ faces to realize we’re on to something with offering organized activities. These descendants of Henry and Ida Kletscher are bonding and building memories. 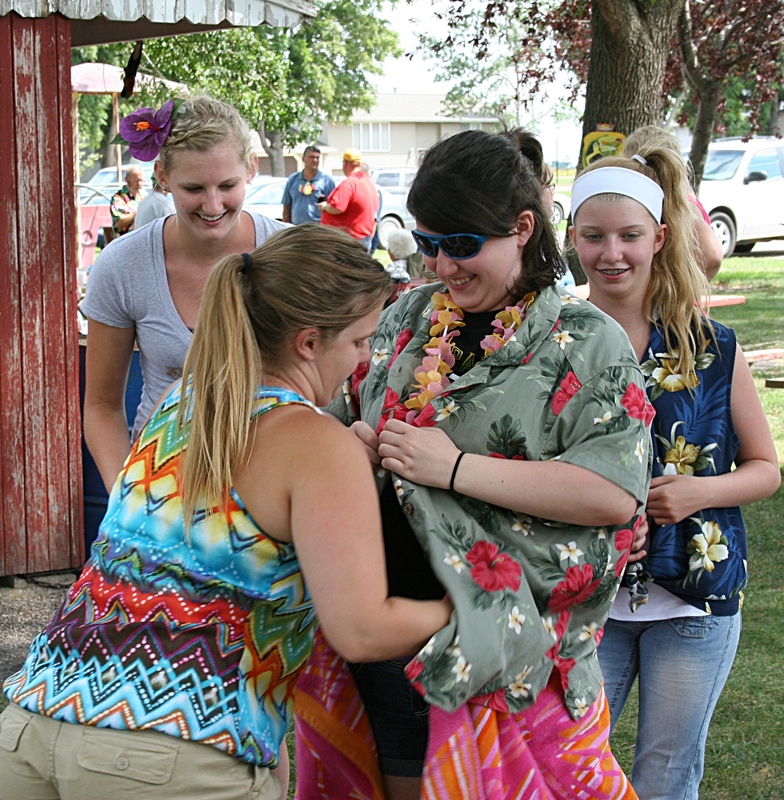 It didn’t take much persuading to get the young adults participating in the Tacky Tourist Relay, helping each other slip into Hawaiian garb and more during our Hawaiian Luau themed reunion. Perhaps 15 – 20 years from now they will circle around a campfire in the Vesta park remembering those gunny sack races or the time they hula hooped or Audrey insisting they join in the Tacky Tourist Relay Race. 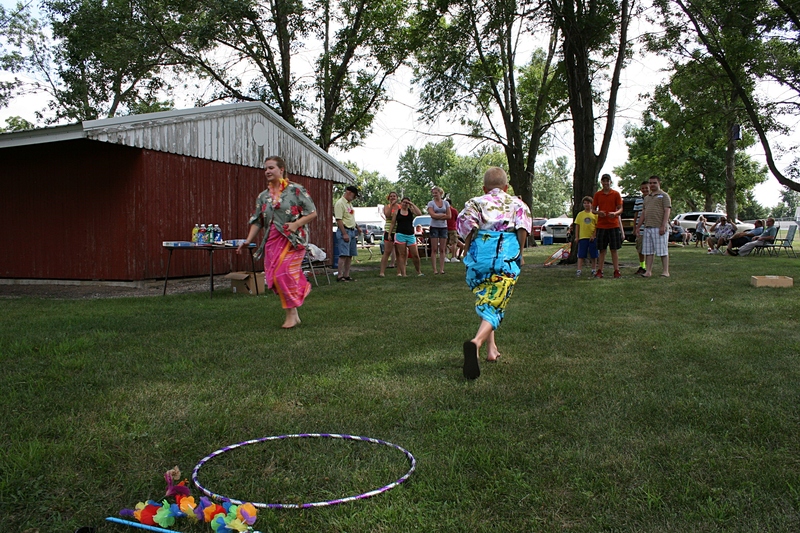 Teams compete in the Tacky Tourist Relay. I hope they will smile at the memories and realize how very blessed they are to be part of a family that has loved one another for generations. Even my generation (OK, they’re a wee bit younger than me) formed a Tacky Tourist Relay team. 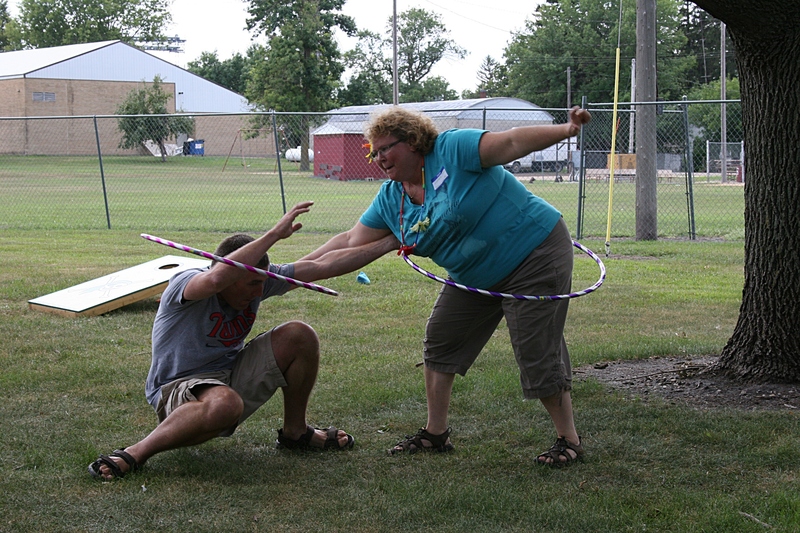 My sister Lanae and cousin Kirt assist each other in the hula hoop competition. I’m pretty certain they did not win. Bridge graffiti along Minnesota Highway 28. DO YOU EVER WONDER—because I do—how, when and why graffiti is spray painted onto bridges, buildings, boxcars and elsewhere? Do these artists/vandals/rebels/criminals (choose the noun that fits) plot and then sneak, in the cover of darkness, to scrawl their messages and art upon these very public canvases? Who are these defiers of rules? Did they scribble with crayons on walls while growing up? Did they doodle in notebooks when they should have been doing homework? Are they reckless and wild or the girl/boy next door accepting a dare? 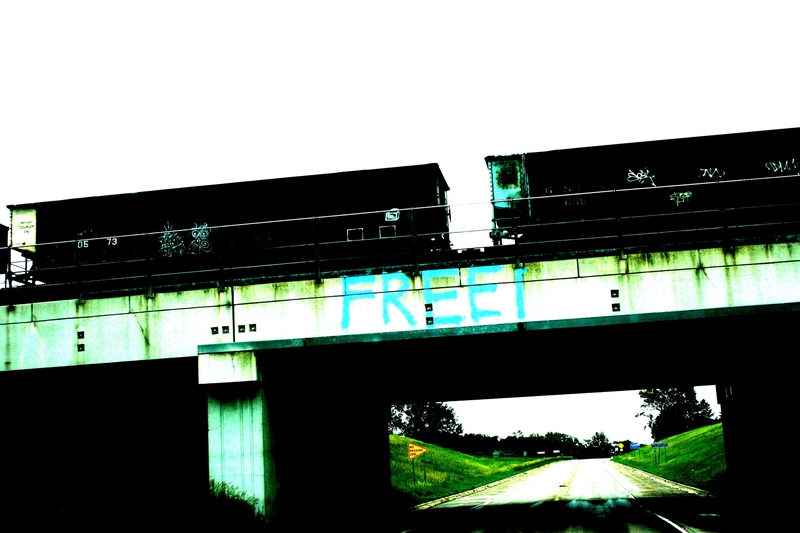 I’ve never known a graffiti artist, although I’d like to meet the one who block-letter-printed “FREE” on this train overpass along Minnesota State Highway 28 between Morris and Sauke Centre. Have you freed yourself from something? Have you set someone free? Or do you simply appreciate what it means to live in the land of the free? 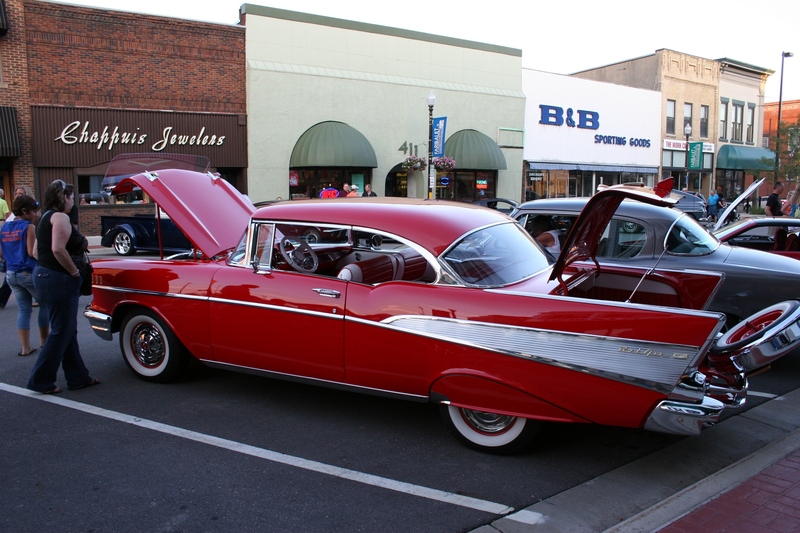 A 1957 Chevrolet Bel Air, parked along Central Avenue in downtown Faribault during the July 20 Faribault Car Cruise Night. DARWIN LINGERS, gripping the handles of his wife’s stationary wheelchair as he admires the 1957 India Ivory and Matador Red Chevrolet Bel Air. Alma seems equally mesmerized, transported back in time to the days of early motherhood and mobility—of youthful legs and a Chevy that hauled her family from farm to town and beyond and back home again. When the family grew too large, the couple ditched the Bel Air and upgraded to a roomier station wagon. 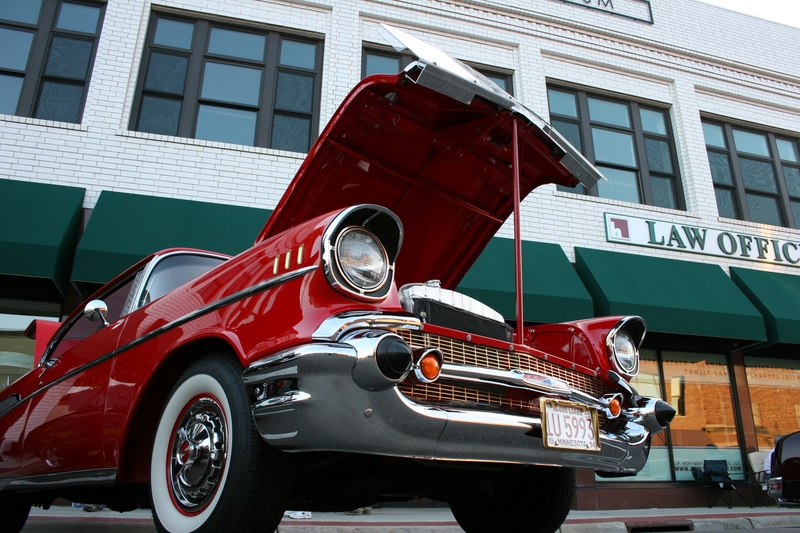 Admiring the popular 1957 Chevy Bel Air in downtown Faribault. But on this Friday evening so many decades later with the kids grown, one deceased, the aging farmer and his wife lock their eyes on the Bel Air waxed to a glossy shine. 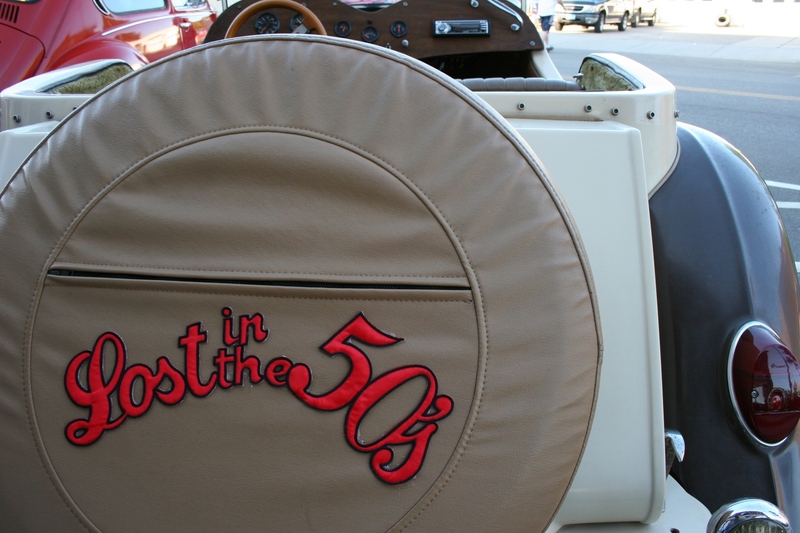 They remember the days of kids piling into the backseat of the 57 Chevy. 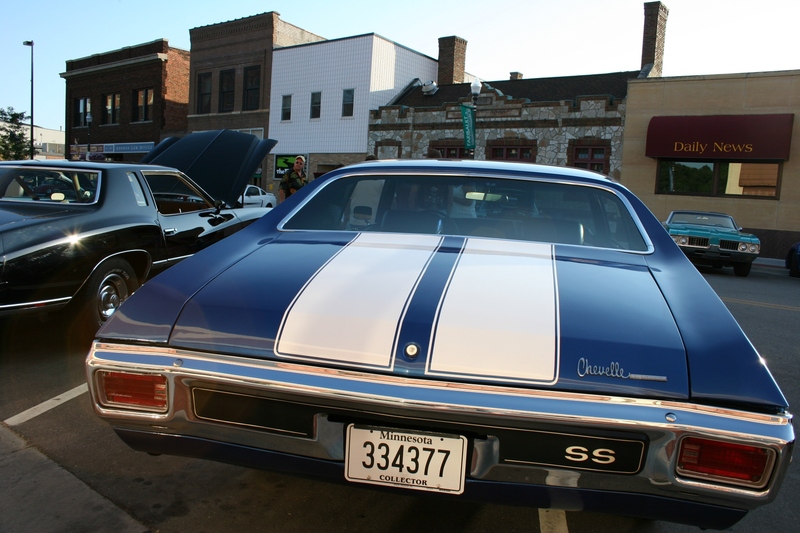 Darwin wishes out loud for that Chevy, just like the one parked on a Faribault city street on a late summer evening. Alma, hands clasped in her lap, nods ever so slightly in silent agreement. 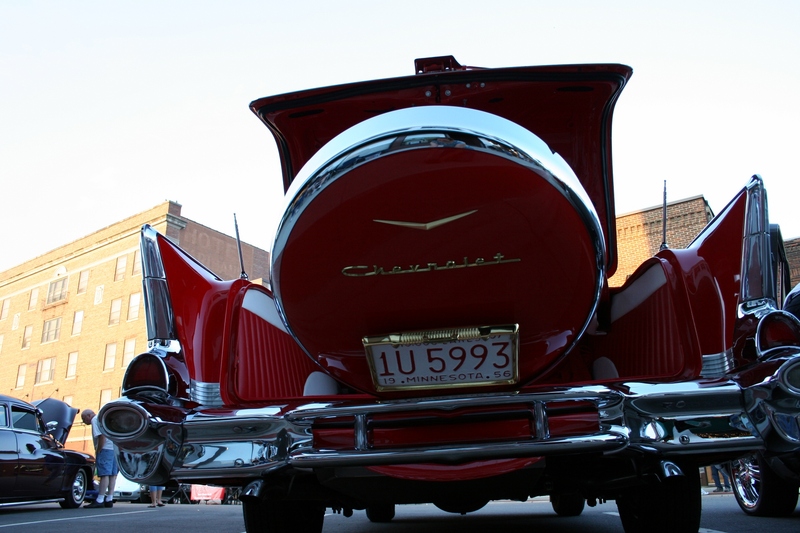 I placed my camera on the sidewalk and angled it up to capture this rear view shot of the 57 Bel Air. And, yes, the date on the license plate says 1956. My husband insisted the car is a 57 and I checked numerous sources to verify the year. 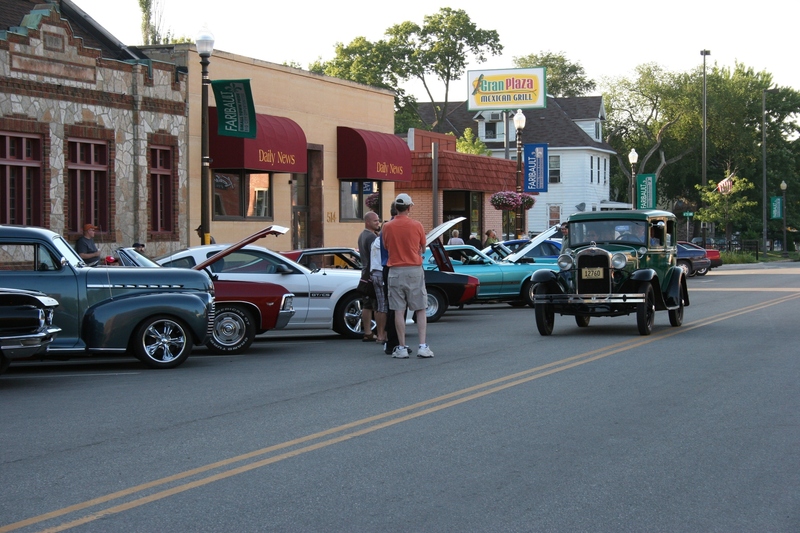 I wonder, as I wander away, how many other such memories are sparked by the old cars and trucks parked along Central Avenue during Faribault Car Cruise Night. 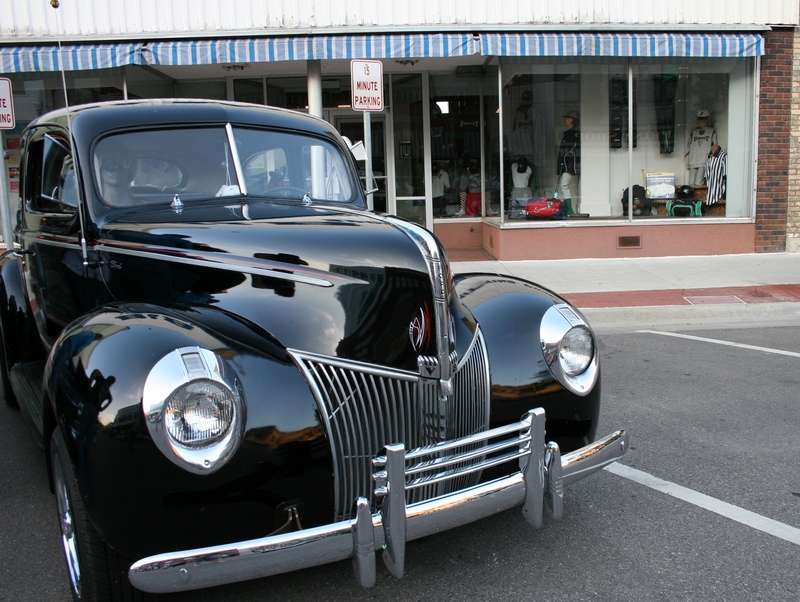 As treasured as those vintage vehicles are for their monetary worth, it is the memories which hold the most value. Just ask Darwin and Alma. 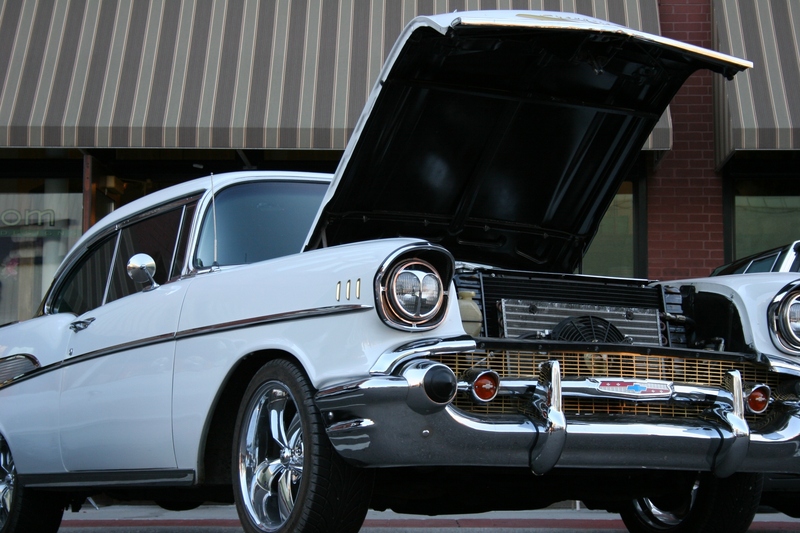 Just another shot of the 57 Bel Air because it was so photogenic and I simply fell in love with this Chevy. 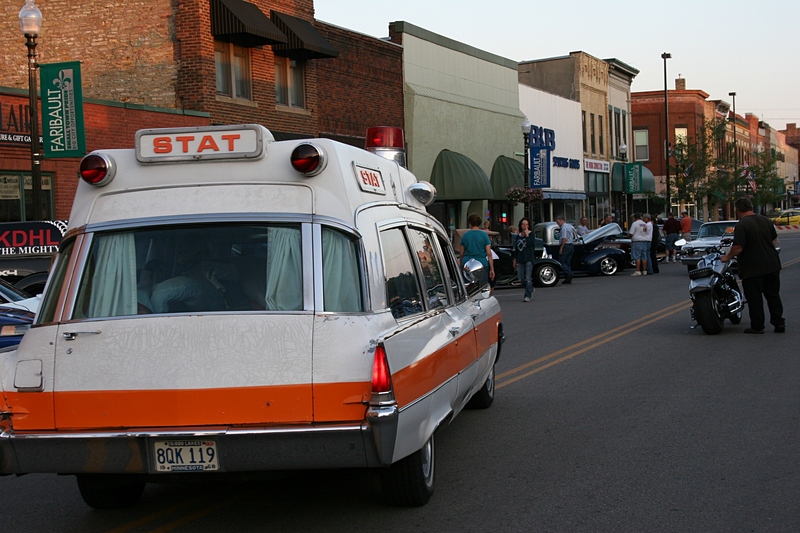 HAVE YOU EVER WONDERED about the types of individuals who own vintage ambulances and hearses. Why? Why would you want a vehicle associated with medical emergencies and/or death? 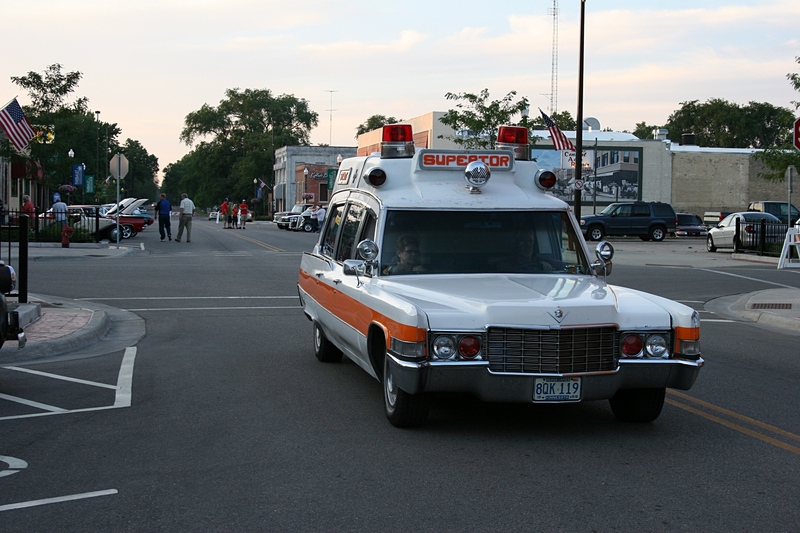 Craig and Kathy Schuster arrive in their 1969 Cadillac ambulance on Faribault’s Central Avenue. 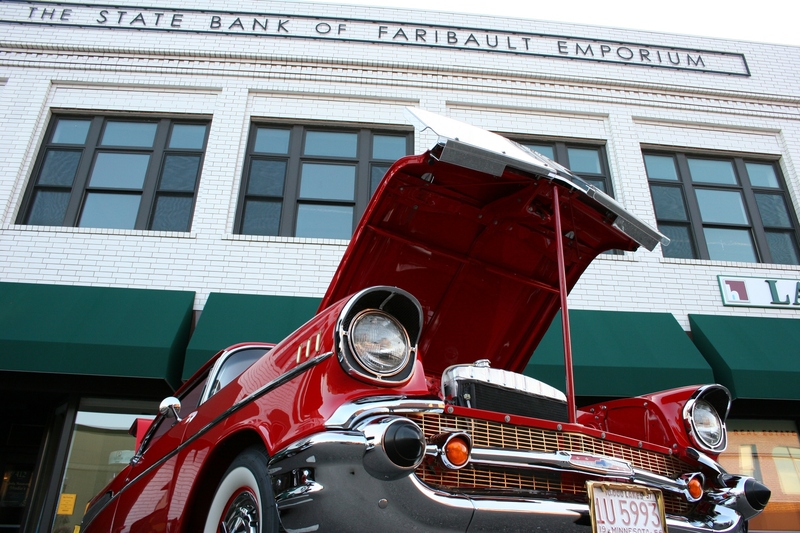 Craig Schuster of Faribault partially answered that question after he and wife Kathy pulled onto Central Avenue in their 1969 Cadillac ambulance during the recent Faribault Car Cruise Night. I practically pounced to get answers from the couple who are members of The Professional Car Society, Northland Chapter, and have also owned a hearse. 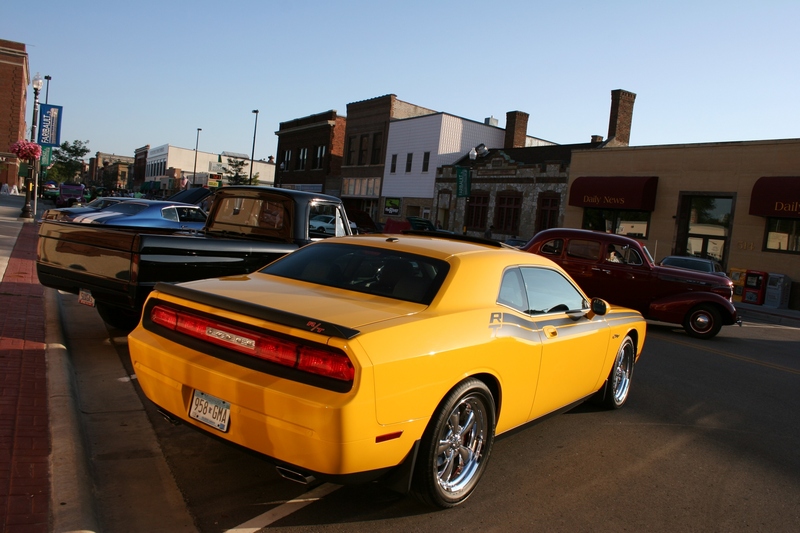 Looking for a parking spot during Faribault Car Cruise Night, held on the third Friday of every month, May – September. For Craig, the interest in ambulances stretches back to his youth. Growing up in Waseca during the 1950s and 1960s, he admired the ambulances driving through town on their way to Rochester. And he did—all three. Craig is a casual EMT, plus a barber, although his wife laughs and admits that’s hard to believe given her husband’s long silver pony tail. Yes, the lights and siren still work. Craig obliged my request to turn on the lights. Part of Craig’s affection for this particular ambulance likely comes from his belief (or perhaps more accurately, wishful thinking) that this could be the very same ambulance used in the 1977-1983 television drama CHiPS. 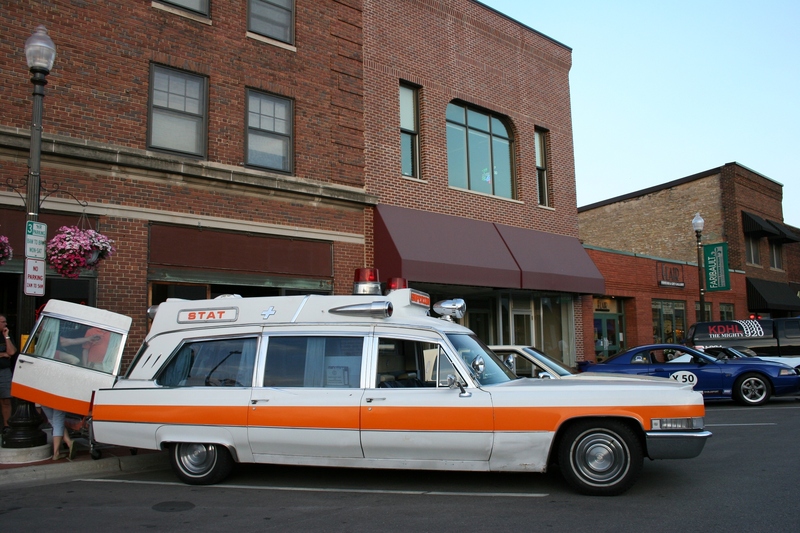 His ambulance, he claims, is identical to the one seen in the show which features the adventures of two motorcycle-riding California highway patrolmen. I really remember only the handsome and macho Erik Estrada in his role as Frank “Ponch” Poncherello. The ambulance? What ambulance? 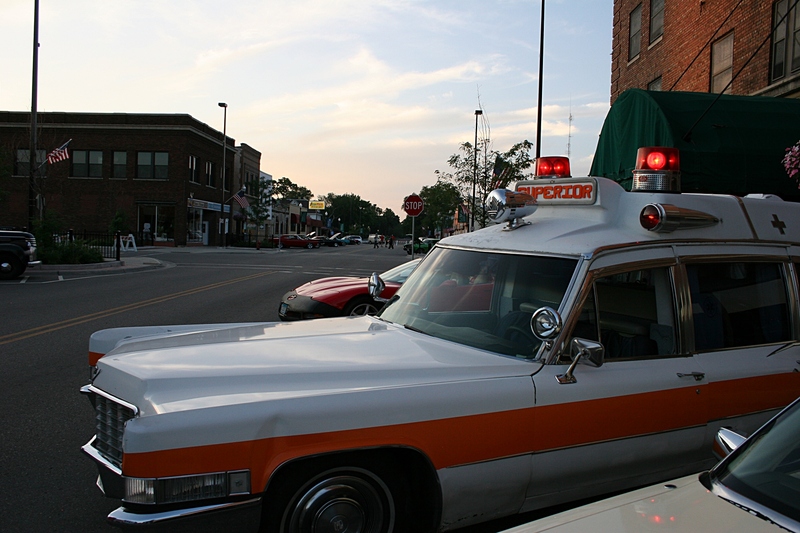 As Craig tells it, his 1969 Cadillac ambulance came from southern California and was on the verge of being crushed in a salvage yard when it was rescued and brought to Minnesota. 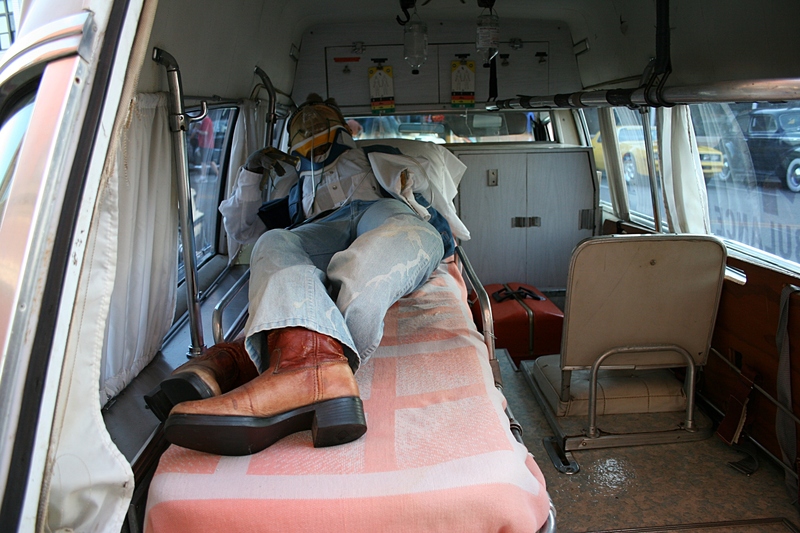 A peek at the drug overdose patient inside the vintage ambulance. Though Craig doesn’t know the detailed history of his ambulance, he can tell you about the patient he’s transporting. The man overdosed on bad acid at Woodstock, the 1969 music festival in New York which attracted more than half a million attendees and went down in music history. 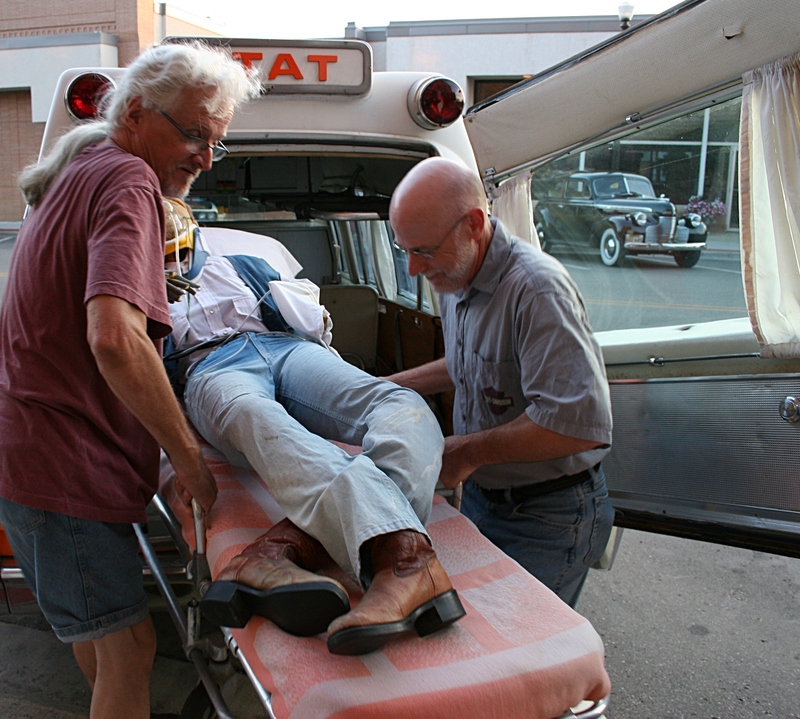 My husband, Randy, helps Craig Schuster, left, unload the patient. Or if you prefer the truthful version, the mannequin comes from a Northfield barbershop and is placed in the front window during that community’s annual Defeat of Jesse James Days celebration in early September. So there you go—one man’s fun with his vintage ambulance and the reason he owns it. This could have been a scene straight out of the 70s, minus the modern car on the right. JIM SCHROT WORRIES about his relative, Wilson Schrot. After all, Jim caught Wilson attempting to steal gas from the gas barrel at Jim’s rural Faribault home last Thursday evening. Jamie, Jim’s grown and married daughter, figures Wilson simply ran out of gas for his lawnmower and decided to help himself. She appears willing to overlook Wilson’s latest antic. “He (Wilson) gets into a lot of trouble,” Jim says. The two don’t elaborate, but say Wilson shows up in the most unexpected of places at the most unexpected of times. Jamie once discovered Wilson inside her tent, curled up in her bed. He’s climbed into family-owned tractors and trucks, but stopped short of stealing them. Not that he could. Wilson, you see, is a dummy. You know, a mannequin. The Schrot family has, for the past several years, embraced Wilson and his shenanigans, ever since a cousin dragged him home from somewhere. No one seems to remember details. 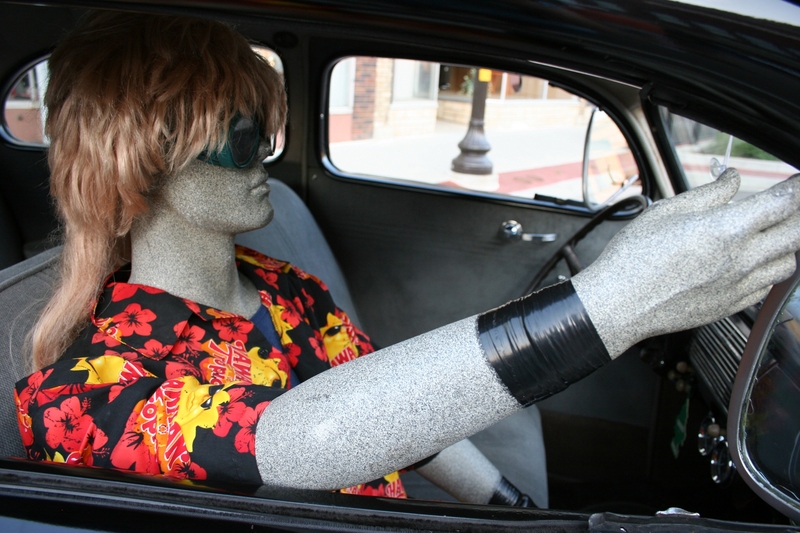 Or at least they weren’t sharing that information with me when I first spotted Wilson in the front passenger seat of Jim’s 1940 Ford at last Friday evening’s Faribault Car Cruise Night. My first photo of Wilson, taken shortly before Jamie showed up to snap pictures with her cell phone. 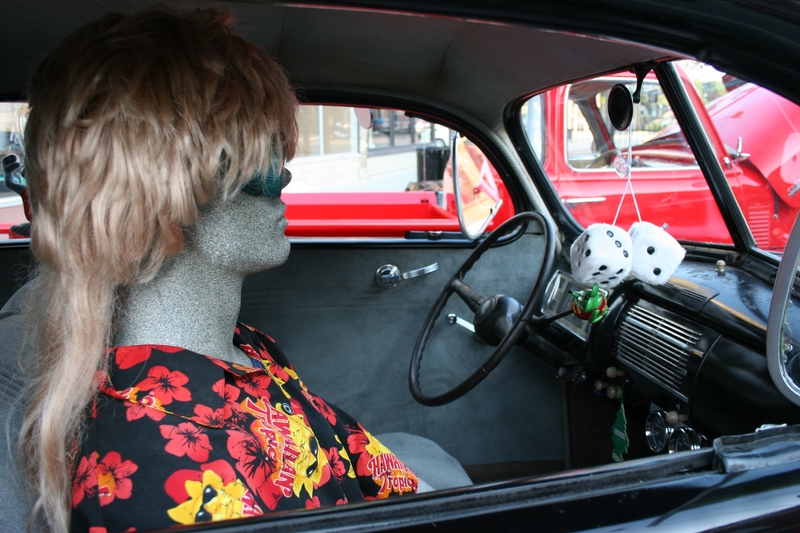 I was photographing the Hawaiian shirt clad dummy with the blonde mullet wig when Jamie showed up to snap photos of him, too. I engaged her in conversation and that’s when I was introduced to Wilson, named after the volleyball in the Tom Hanks’ film, Cast Away. Not that Wilson is a castaway. I mean, Jim didn’t abandon Wilson after he caught him trying to steal gas. Instead, he brought him to the car show in an apparent half-hearted attempt to find a date for Wilson. Jim and Jamie suggest Wilson switch out his hair piece—he has several—to improve his appearance and likelihood of landing a date. Jim reposed Wilson, who recently had carpal tunnel surgery (thus the duct tape), so the story goes. The Schrot family has given Wilson a life, even going so far as to establish a Facebook page for him. Ask Jamie if she set up Wilson’s Facebook account and her quick, snipped response of “maybe” is enough to tell you she did. Based on Wilson’s Facebook page—the public part that I can read because I’m not on Facebook—he is a country boy who likes his beer. He also likes singer Johnny Cash; the movie, The Adventures of Bob & Doug McKenzie: Strange Brew; the book, I Hope They Serve Beer in Hell; and the tv show, Richard Bacon’s Beer & Pizza Club. He also enjoys the sport of beer darts. Wilson certainly keeps the extended Schrot family entertained, laughing, making up stories and plotting his next adventure. It is the stories, Jamie says, which make the whole Wilson gig fun, if not crazy. For example, when Wilson was caught trying to steal that gas, Jamie got the story rolling about his lawnmower running out of gas. Meet Jim Schrot, not to be confused with Wilson. 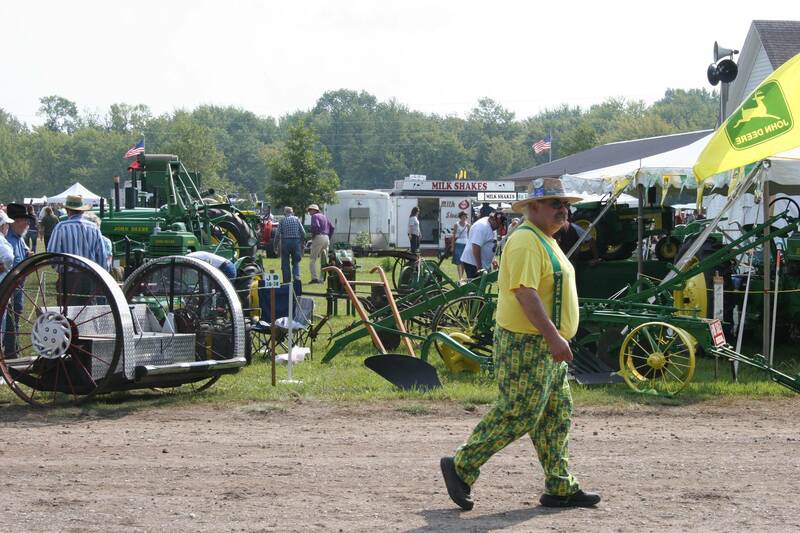 I first spotted Jim in September 2009 at the Rice County Steam and Gas Engine show and dubbed him the flamboyant John Deere guy. It fits. See why this family embraces the likes of Wilson Schrot. A Ford Model A drives into downtown Faribault on Central Avenue during the July 20 Faribault Car Cruise Night. I NEVER THOUGHT I would find old cars and trucks interesting. Not in a million years. But I’ve acquired, in recent years, an appreciation for the vehicles of yesterday displayed at local car shows. I credit my smart and talented automotive machinist husband, who is like a walking Wikipedia when it comes to knowledge of vehicles, for my interest. Randy finally convinced me to tag along once to a car show and that was it. HIS VIEW: Not my color, not at all. 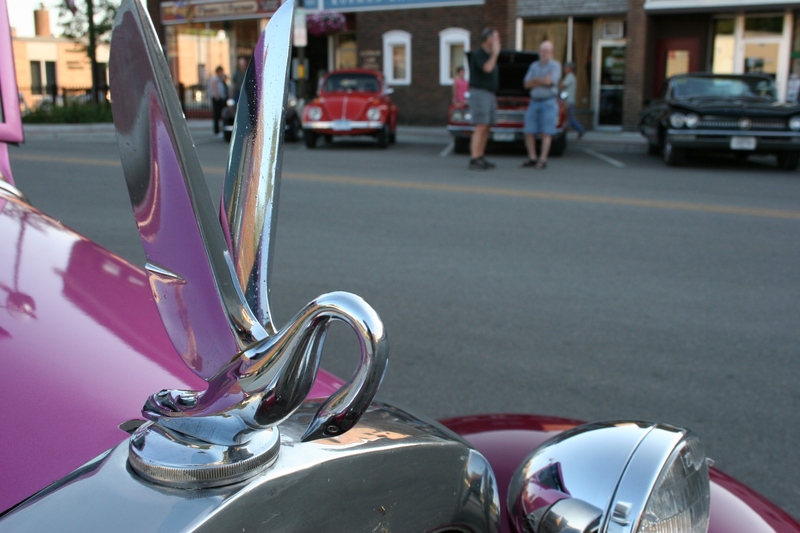 MY VIEW: The graceful curves of a swan hood ornament draw my eye to this street rod. Our reasons, though, for appreciating these cars and trucks of the past differ. He’ll peer under the open hoods and such while I’m admiring hood ornaments and emblems, the curve and sweep of metal, paint colors and more. HIS VIEW: Lotta teeth there. 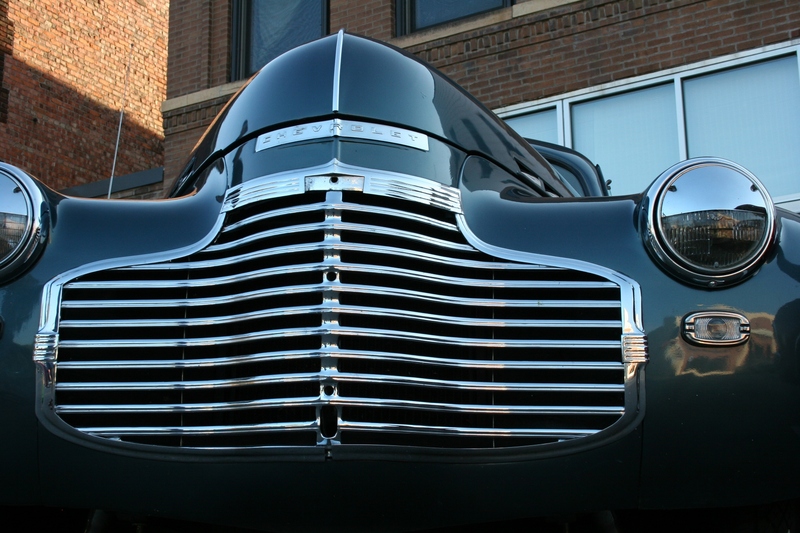 MY VIEW: Can you see my reflections in the shiny, curvy bumper art on this car? My interest springs from an artistic and photographic perspective. His is more mechanical and practical. And as a bonus, if I overhear or discover a story or two at these shows, I value the displayed vehicles even more. 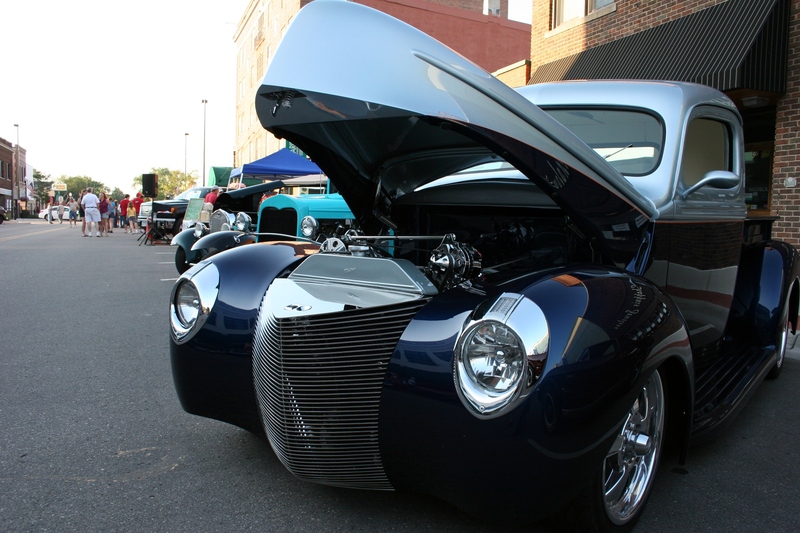 Watch in upcoming days for several interesting stories from the July 20 Faribault Car Cruise Night. It was quite a night for stories, as you will read. Until then, enjoy these photos. HIS VIEW: Let’s buy one, but not a yellow one. 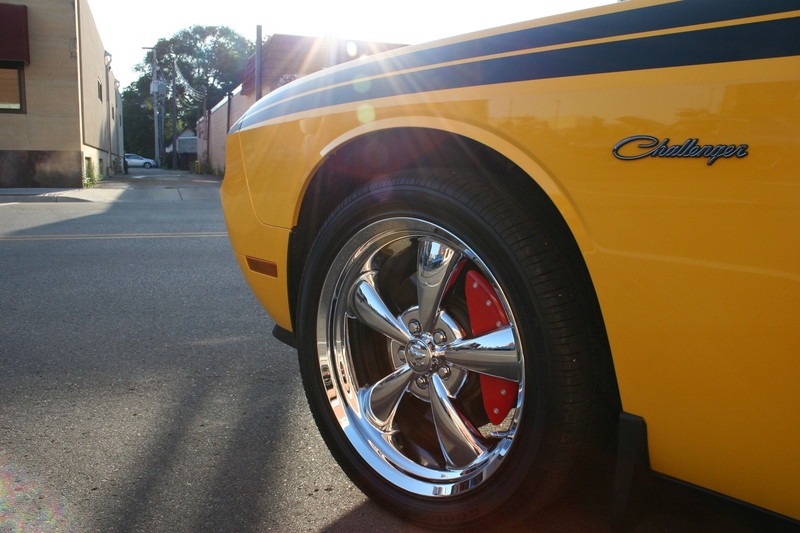 MY VIEW: Look how the setting sun glints across the hood as I photograph those magnificent, detailed wheels. HIS VIEW: That would be a nice old pickup to own. MY VIEW: Loving the stylish sweep of the front end. HIS VIEW: Why are you photographing that taillight? 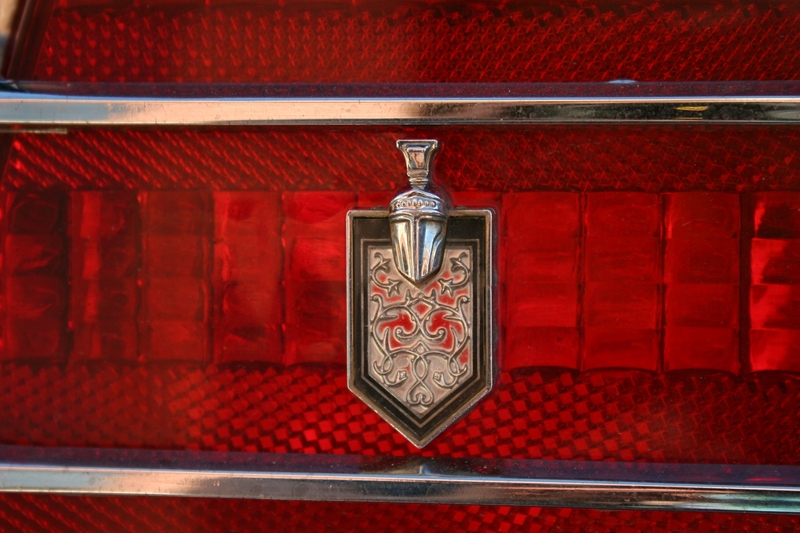 MY VIEW: Just look at those shimmering reds, the honeycomb effect and that royal art. HIS VIEW: A good cruisin’ car. MY VIEW: It’s the stripes, the stripes, oh, yes, the stripes that lead my eye across the trunk and beyond. 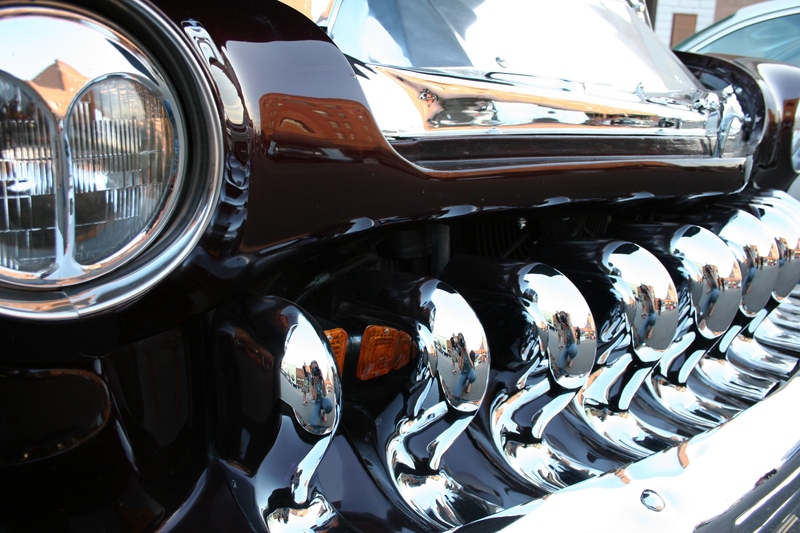 HIS VIEW: I’d love to own that 1930s vintage Chevy truck. MY VIEW: I know you would, dear. It is pretty sweet. 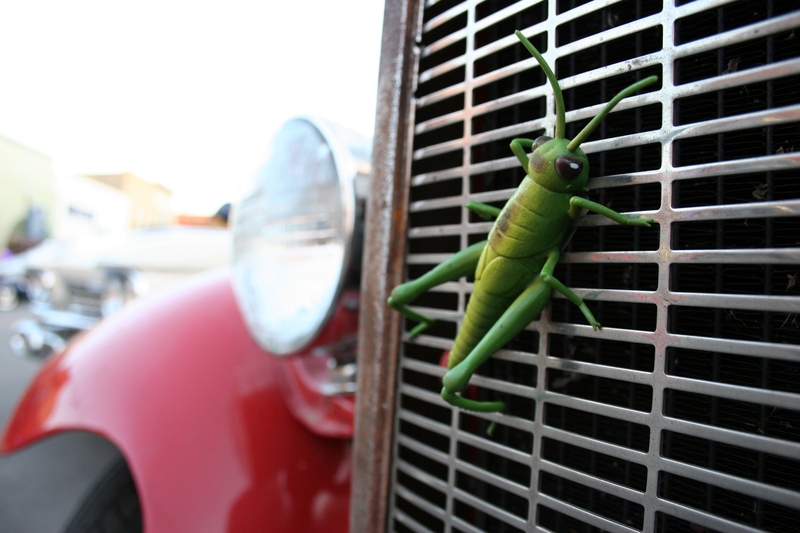 HIS VIEW: I didn’t know grasshoppers grew that big. MY VIEW: Thanks for making me laugh and bringing back memories, for me at least, of all those grasshoppers on the farm when I was growing up. 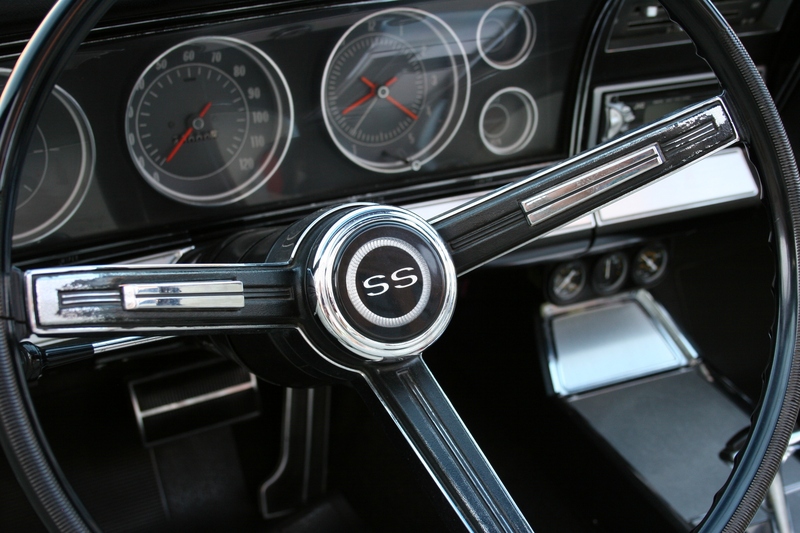 HIS VIEW: That’s the inside of a 1967 Chevy Impala Super Sport. MY VIEW: Look at all those circles, circles, circles. 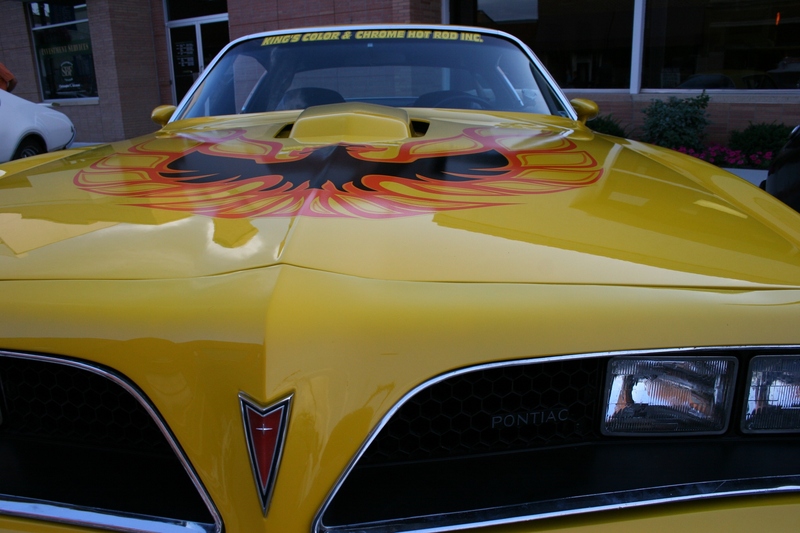 HIS VIEW: A good looking Pontiac Firebird. MY VIEW: Art. HIS VIEW: Insert key here. 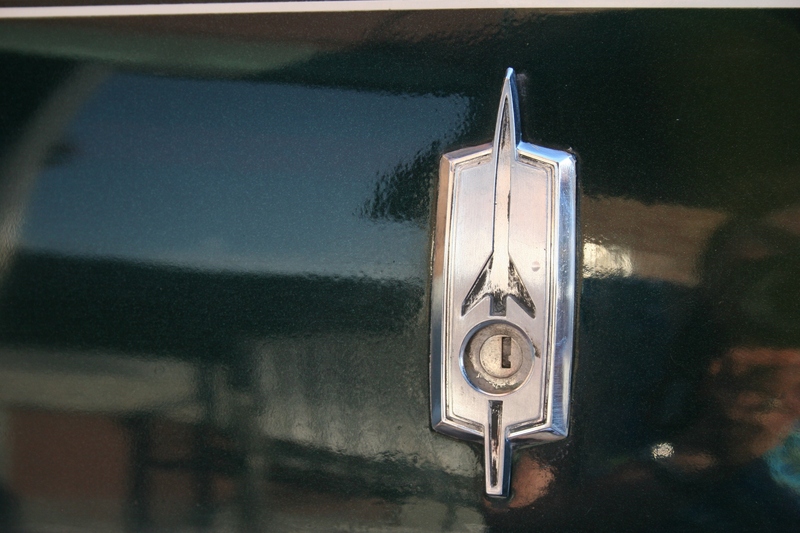 MY VIEW: I’ve never noticed a rocket emblem before on a car (Oldsmobile Ninety Eight). HIS VIEW: Check out the motor. MY VIEW: One sweet Chevy. 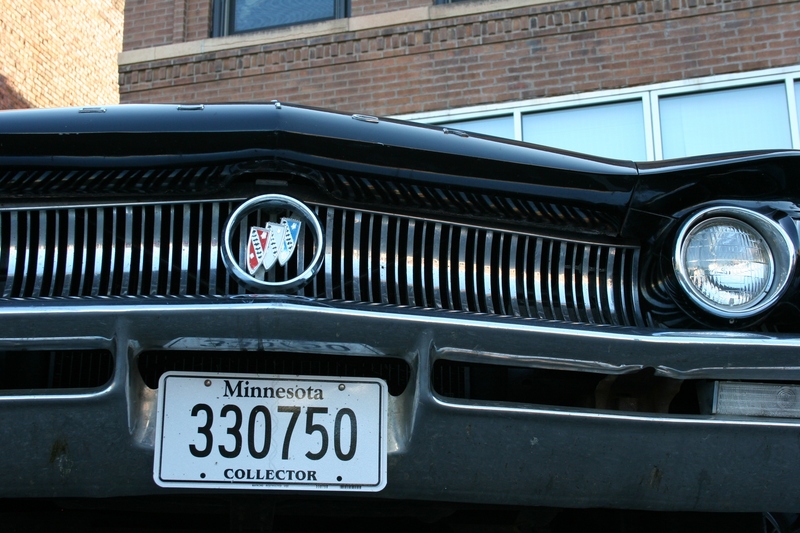 HIS VIEW: Just the front of a Buick. MY VIEW: Vertical lines on the front of the car and the building behind create a pattern. MY VIEW and maybe HIS VIEW, too: Nice curves. MY VIEW: A fancy, schmancy MG with a royal air. 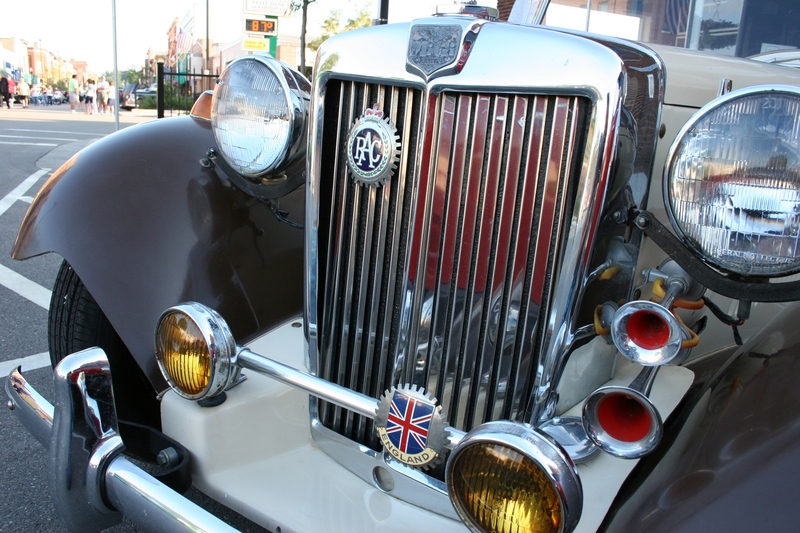 HIS VIEW: I never cared too much for British cars. 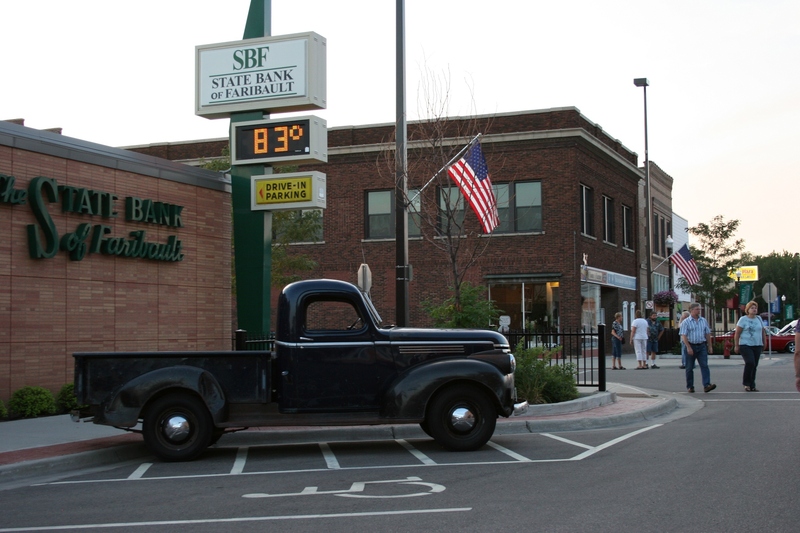 OUR VIEW: Lost in the 50s, 60s, 70s…on a Friday evening in downtown Faribault. 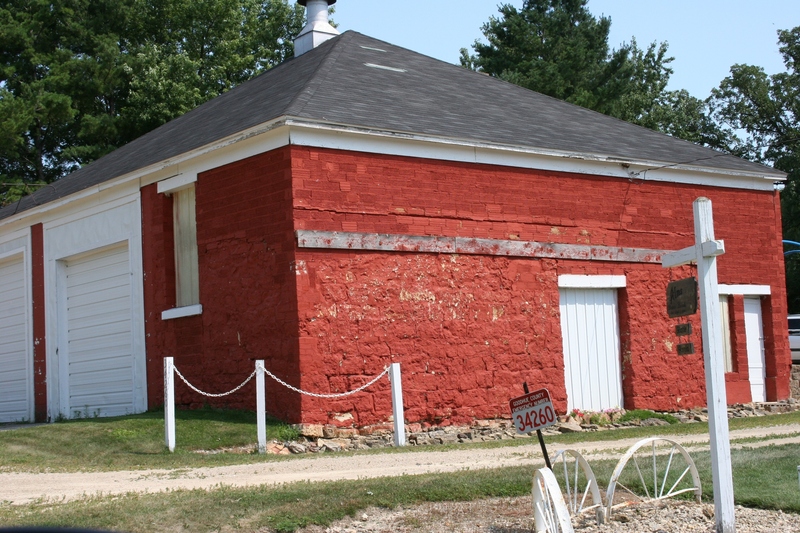 An old building, perhaps a former blacksmith shop, in Belvidere Mills. GHOST TOWNS INTRIGUE ME. I wonder—who lived in these places and were these towns once thriving and why did people leave? Often, placement of the railroad determined which Minnesota town survived, which did not. Recently my husband and I, on one of our day trips, turned off Goodhue County Road 3 about 10 miles south of Red Wing, onto Hogsback Road and into Belvidere Mills. Yes, Hogsback Road. When you read a street sign like that, you just know there’s a story somewhere that’s been passed down from generation to generation. If only I knew the right old codger to consult for a little history lesson on the road that now also is called Wellscreek Trail. I’ll travel on Hogsback Road, thank you. The former Belvidere Mills creamery, modernized into a garage. 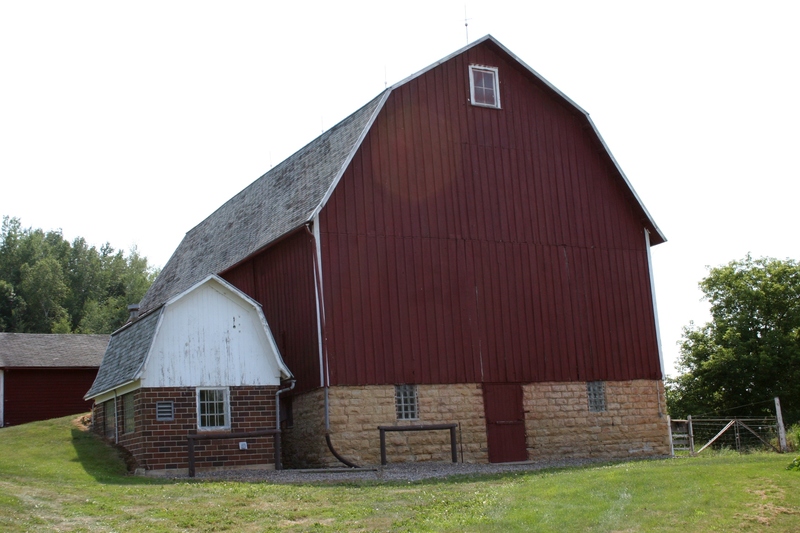 The first view we got of the lovely old barn in Belvidere Mills. 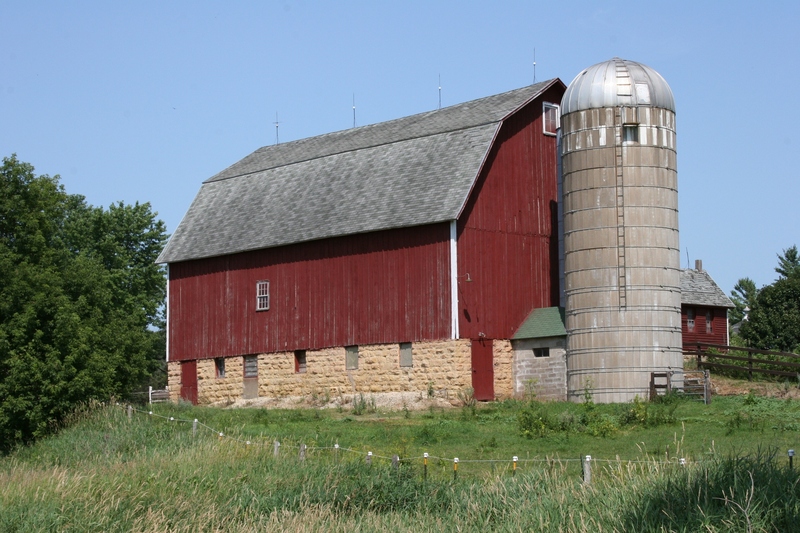 And so we did, up the hill on Hogsback Road past a handful (or less) of houses and the old creamery and a stately red barn and past another old building (perhaps a blacksmith shop), around a curve in the gravel road and we were already out of Belvidere Mills. We turned around and backtracked. Our second view, the side, of the barn as we backtracked into the ghost town. And back again past the old building in the top photograph, this a side shot. What is it, readers? 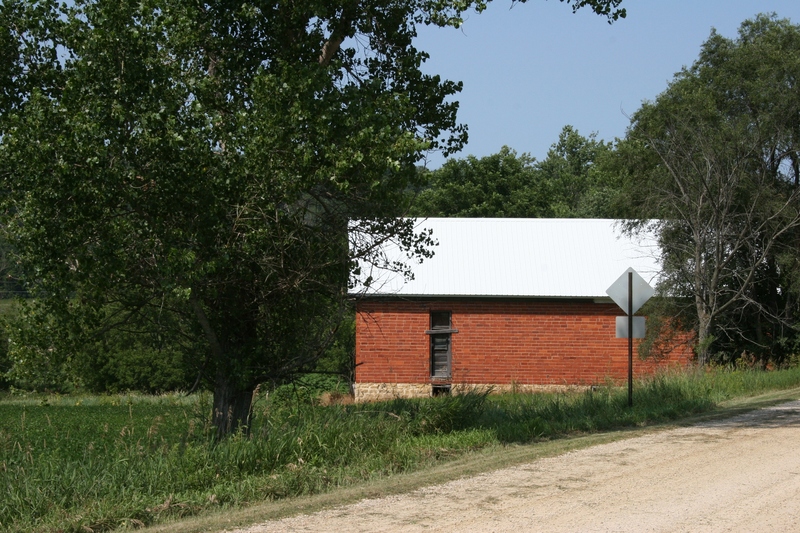 Thanks to signage placed by the Goodhue County Historical Society along the county road, we knew this was the site of the former Belvidere Mills, established in 1858. 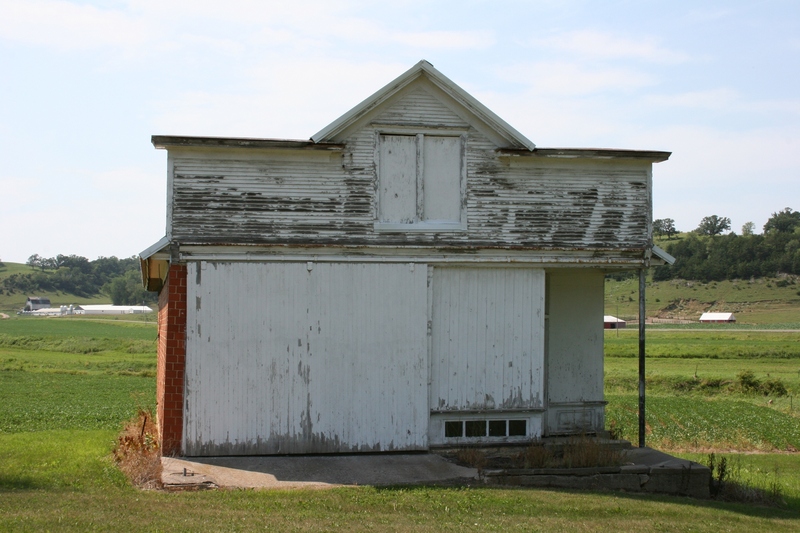 The historical society has marked some 60 ghost towns in Goodhue County with signage to “preserve their history and to recognize their historical contribution.” All either once had, or currently have, post offices. They also have intriguing names like Black Oak, Cannon Junction, Featherstone, Roscoe Centre, Skyberg and White Willow. And then there are the Goodhue County Minnesota ghost towns of—ready for this—Lena, Norway and Miami.